As I was watching the Voice Monday night, it was like I was hearing this song for the first time. I am a child of the 80’s and have always been a huge Michael Jackson fan. I have heard this song many times and it had never resonated with my soul the way it did Monday night. This song is decades old and yet it still speaks to where we are today. This world is in chaos. This nation is in chaos. We, as a society, look to our own needs, instead of looking out for the needs of our neighbors. We live in a world where human trafficking is the fastest growing crime in the world. We live in a world where we turn a blind eye to women and children being beaten in their own homes. We live in a world where we fight violence with violence and no one is willing to compromise. We see the homeless person on the street, but ignore him as we walk by. Our hearts have been hardened by greed, selfishness, and apathy. We complain about the crime, violence and chaos, but we are quick to blame others for the mess this world is in, “well, if she had acted differently this wouldn’t have happened.” or “he saw what was happening, he should have done something.” It is always someone else’s fault. How long is it going to take before we look in the mirror at our own reflections and decide that we have had enough? How many people will die before we decide that we, as individuals, need to start making changes in our own world? We all have excuses. Those excuses aren’t a good enough reason to stand back and watch people suffer, when we can do something. It starts with ME. It starts with YOU. We each need to open our hearts and see where it is that we need to make a change in ourselves, so that we can make a change in this world. Are you willing to look in the mirror and make the change? I am. We can’t continue to sit back and watch as this world falls apart. We need to listen to Michael Jackson and start with the man in the mirror. 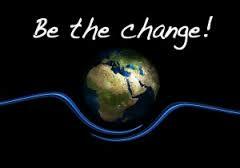 What change do you need to make in yourself to make a difference in this world? *Disclaimer: this is not the entire song. I have condensed it to fit the purposes of this blog post.